WINSTED – James A. Royer, 73, passed away on Wednesday, January 9, 2019. Born November 7, 1945 in Winchester; the son of the late Arthur and Beatrice (Warner) Royer. He was a lifelong resident of Winsted. Jim proudly served in the U.S. Navy and then for the Air National Guard. He worked for many years at Colt’s Firearms. 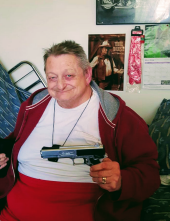 He enjoyed playing darts, collecting coins, guns and John Wayne collectibles along with his other collections. He was a member of the V.F.W. Post #296 in Winsted, the Redmen’s Club #39 and Eagle’s Club of Torrington. He is survived by his daughter, Diane Rivera and husband Isaias of FL; two sons, Robert Bergenty and Joshua Bergenty, both of FL; brother, Butch Royer of Colebrook; cousin, Bill Perry and his wife Barbara Rice of Winsted; grandchildren, Keegan, Brianna, Patrick, Mia, Jay-Lynn, Jackson, Madison and RJ; mother of his children, Brenda Folland of FL; and close friends that became family, Nicole Gagnon and husband Jeremy and their daughter, Katie and Shelby Cullen and husband Bret and their daughter Gracie of Winsted; and lots of other friends and family. He also leaves a granddog, Hercules. A Celebration of Life will be held on Saturday, January 19, 2018 at the V.F.W., 114 Colebrook River Road, Winsted from 12 – 4 PM. Burial with full Military Honors will be held at Forest View Cemetery, Winsted in the spring. Montano-Shea Funeral Home, 922 Main Street, Winsted has care of the arrangements. Memorial donations may be made to: V.F.W. Post #296 in Winsted. Visit an online guestbook at Montano-shea.com. To plant a tree in memory of James A. Royer, please visit our Tribute Store. "Email Address" would like to share the life celebration of James A. Royer. Click on the "link" to go to share a favorite memory or leave a condolence message for the family.